The recipe will make gnocchi for two people. 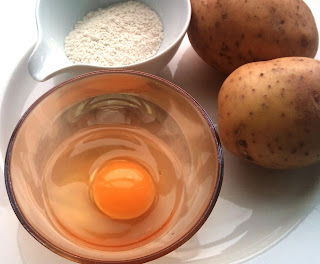 Place the mashed potato in a bowl and make a well in the centre. Add the beaten egg and stir to combine. Next add the flour and continue to stir for a minute or so until it comes together to form a rough dough. Remove from the bowl to a floured plate or work surface and cover with a clean cloth or tea towel and allow to rest for 15 minutes. When the dough (and you!) 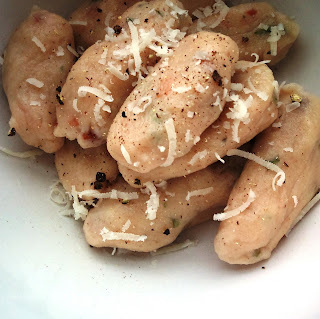 have rested for 15 minutes, you can start to roll out the gnocchi. Divide the dough into two and roll each half into a sausage shape that's about half an inch in diameter. Slice the roll into approximately 1 inch pieces. Next, lightly dust the work surface with flour again and lightly roll each of the pieces around to form small dumplings. Continue until you've used all the potato mix. You should flour the board a few times during the process. The gnocchi can be stored in the fridge for up to 24 hours until you're ready to serve them at this stage. To cook the gnocchi, bring two pints of water to the boil in a large pot over a high heat and add the salt. When it's boiling, add approximately 6 to 8 dumplings to the pan and allow them to bubble away for 3-4 minutes. They should float to the top when they are ready. When they are ready, remove from the pot using a slotted spoon and keep on a warmed plate. Continue until all the dumplings are cooked. Serve with a little grated parmesan, a good twist of black pepper and a little salt if needed. (The parmesan can be quite salty sometimes, so don't add too much salt). If you are serving them with a pasta sauce, simply drop them directly into the sauce and allow to heat through again before serving.